McColl’s takes every measure to create a safe environment, ensuring our customers’ products arrive safely and all our people get home safely each day. Our aim is to provide safer vehicles, safer drivers and a safer community at large. McColl’s commitment to safety has reduced Lost Time Incidents and Significant Lost Time Injuries to below the industry benchmark. We execute our own vigorous OH&S systems and procedures to ensure legal compliance including our CoR (Chain of Responsibility). Monitoring and measuring driver fatigue, work diaries and shift scheduling. Actioning safety and other potential risks as part of monthly toolbox meetings. Undertaking risk assessment and management at McColl’s and customer sites. McColl’s Safety Improvement Group addressing causes and management of incident trends. Conducting CoR education and training for customers. McColl’s investment in a Driver Training Simulator demonstrates our commitment to heavy vehicle road safety. The simulator ensures all our drivers are prepared to face the challenges of today’s road conditions. They can practice responding to potentially dangerous situations such as wet weather, brake failure or tyre blow-outs in a realistic but risk-free environment. McColl’s is committed to providing high quality services which comply with or exceed all regulatory requirements. We are the only specialised bulk liquid carrier audited for Chain of Responsibility compliance under the Heavy Vehicle National Law from the Australian Logistics Council, as per the National Logistics Safety Code. Quality management accreditation to ISO 9001. Dairy food safety licences, HACCP-accreditation and licences covering the transport of bio-dynamic milk, water, grape must and juice. National Heavy Vehicle Accreditation Scheme (NHVAS) accreditation for fatigue management, mass management and maintenance management. Accreditation from the Australian Institute of Petroleum (AIP) for safe load pass testing for fuel refinery compliance. McColl’s accreditations are regularly audited by third-party bodies or government authorities. McColl’s is committed to continually improving safety, service, productivity and accountability. Using technology and systems is a key way to achieve this service. Our new online customer portal gives customers real-time updates on their shipments including order integration and tracking pick-up and delivery schedules. 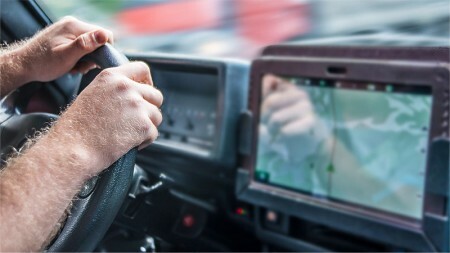 GPS telematics software in every vehicle for real-time fleet tracking and scheduling. In-cab mobility platform to communicate delivery confirmation to customers and manage driver fatigue and compliance. Advanced vehicle routing optimisation to ensure customers’ products arrive at their destination as efficiently as possible. Reporting of key performance indicators using modern business data analytics and operational dashboards. McColl’s is serious about its environmental responsibility as an efficient transport provider and we are determined to reduce our carbon footprint even further. A major focus is reducing carbon emissions through fuel efficiency – reducing our fuel use by just one per cent is equal to taking 136 cars off the road. Regular fleet upgrades to ensure fuel efficiency and reduced carbon emissions. Remote fleet monitoring and analysis to assist driver trainers and encourage greener driving. Trial of speed and RPM limiting, alternative fuels and idle-time shutdown. Modern fleet adhering to the latest emissions standards with more efficient engines. McColl’s operates a dedicated, modern fleet comprising a range of prime movers, tankers, custom-designed road trains and ISO containers. We regularly upgrade our fleet to ensure we comply with and exceed safety standards and operate up to date, environmentally-sustainable fleet. 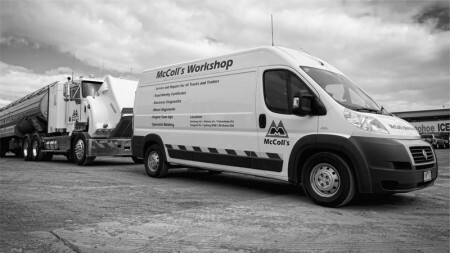 With workshops around the country manned by our skilled mechanics and maintenance engineers, the McColl’s fleet is safe, primed and ready to roll all year. Tanker washing facilities are strategically located to keep our fleet clean for their next loads.